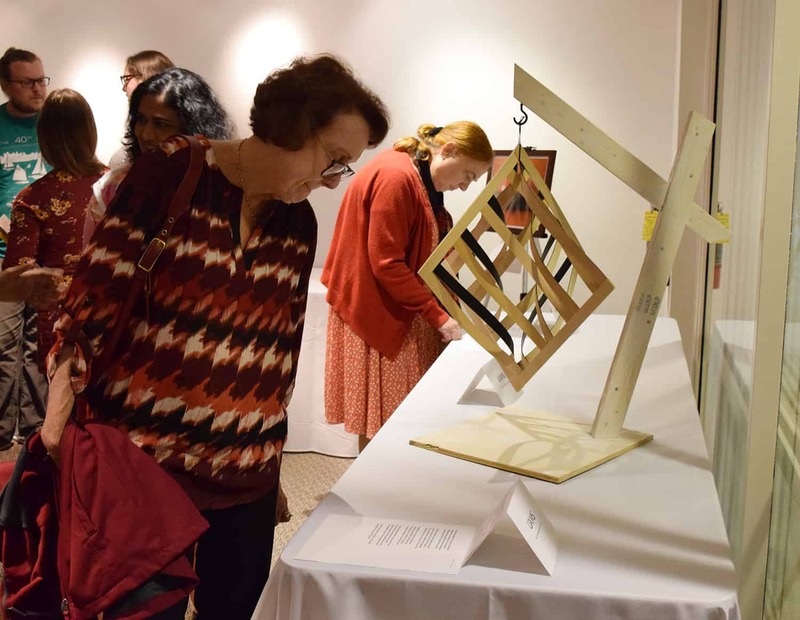 An Art from the Heart attendee examines Octahedral with Curve, a woodwork piece created by Shalese Fitzgerald. 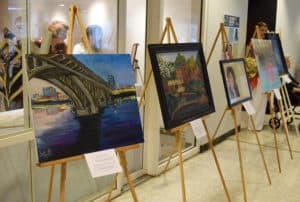 April 12, 2019 | April 12, 2019 | UAMS employees and students showed off their creative sides during the Art from the Heart exhibit April 6 at the Arkansas Arts Center. About 30 members of Team UAMS submitted artwork for the first Art from the Heart. About 30 members of Team UAMS displayed paintings, photography, poetry, woodworking, knitting and more at the inaugural event. Sponsored by the UAMS Office of Interprofessional Education, the event was the brainchild of Wendy Ward, Ph.D., director of Interprofessional Faculty Development. 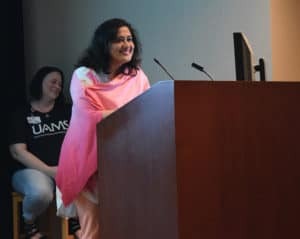 “Those who work in a setting with the ill, injured or dying all feel the importance of their work, and the impact it has on the patients and families who come to UAMS,” she said. “This work can be stressful as well as deeply satisfying. A panel of judges evaluated the exhibition pieces and selected nine favorites. Those artists were invited to give a short presentation during the event. 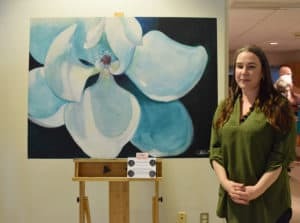 “Magnolia Blossom,” a painting by Jessica Lowder, a bid coordinator in the procurement office, was the judges’ top pick. Lowder, who previously worked at the Arts Center, said she has been “obsessed with drawing and painting” since she was a small child, going so far as to often abscond with her father’s art supplies. “Magnolia Blossom” is one of a series of flower portraits that Lowder has painted over several years. Hanson, a radiation safety officer, said her drawing came about because of an online challenge called Inktober in which artists are encouraged to create artwork using ink during October. 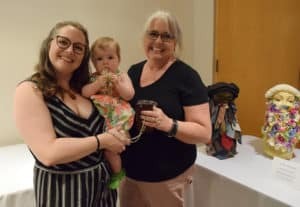 Kristin Alexander, (left) who created “She Beards,” enjoys the event with her family. Hicks, a second-year medical student, said she wanted to make something that merged art and her medical career. She created used dried flowers in resin to create the image of a human heart. Several audience members suggested she create more pieces, such as a lung or a kidney. For Miller, a first-year physician assistant studies student, the painting she submitted was one she started five years ago after being inspired by learning about muscle and bone physiology. After spending time in the gross anatomy laboratory over the summer, she went home, pulled the piece back out and started changing it — adding red, teal and black. Manisha Singh, M.D., told the audience that poetry is a very personal thing for her. “I think the painting is finished now,” she said with a laugh. Singh’s poem was written with the perspective of a patient with dementia and was a reflection of the sadness she felt while taking care of a dementia patient during her residency.